This enclosure for archaeological remains at Ephesus elegantly reconciles historic conservation with accessibility for visitors.The site of a succession of great ancient civilizations,Ephesus,on the south-west coast of modern Turkey,embodied a peculiarly fertile synthesis of architecture and culture.In 356BC the Greeks built the Artemesium (a colossal Ionic temple dedicated to Artemis the fertility goddess) which was one of the Seven Wonders of the ancient world.During the 2nd century BC, Ephesus was the fourth largest city in the eastern Roman Empire,famous for its Artemesium,the Library of Celsus and its medical school. Ephesus; Ancient Greek city of Asia Minor,near the mouth of the Menderes River,in what is today West Turkey,South of Smyrna (now Izmir).One of the greatest of the Ionian cities,it became the leading seaport of the region.Its wealth was proverbial.The Greek city was near an old center of worship of a native nature goddess,who was equated with the Greek Artemis,and c.550 B.C.a large temple was built.To this Croesus,who captured the city,contributed. When Lydians attacked their cities,Ephesians defended themselves by tying a rope from The Temple of Artemis.But it was not a good way to defend a city.Croesus of Lydia captured it easily however he did not destroy.The city reached the "Golden Age" and became a good model to the Antic World in culture and art,as well.Building of the Artemission was going on.Croesus had a great respect to Artemis and he donated 36 columns with sculptures in relief.Some parts of these sculptures are in the British Museum today. 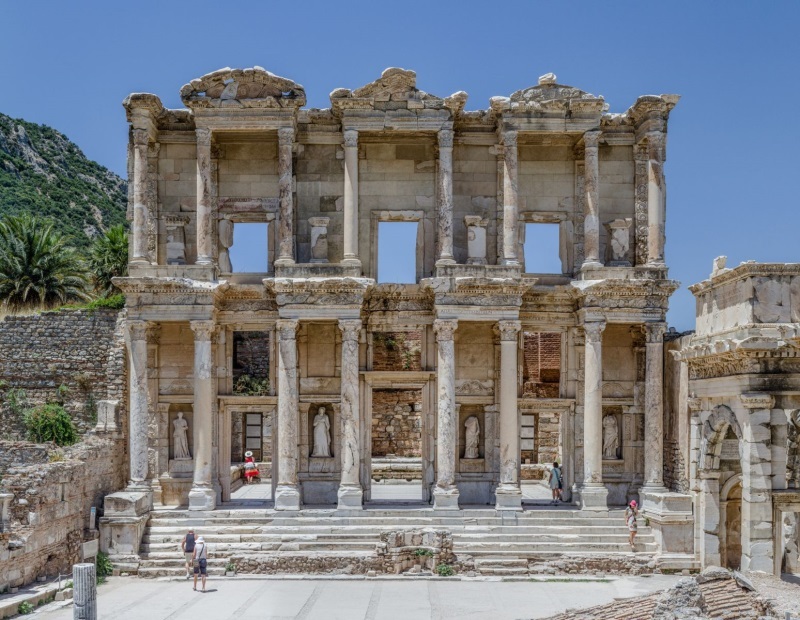 From Lydian control Ephesus passed to the Persian Empire.The temple was burned down in the 4th cent. B.C.but rebuilding was begun before Alexander the Great took Ephesus in 334.The city continued to thrive during the wars of his successors, and after it passed (133) to the Romans it kept its hegemony and was the leading city of the province of Asia.The great temple of artemis,or Artemis, called by the Romans the temple of Diana, was considered one of the Seven Wonders of the World. From c.100 B.C. to c. A.D. 100 Ephesus was the world capital of the slave trade. The city was sacked by the Goths in A.D. 262, and the temple was destroyed.The seat of a church council in 431,Ephesus was abandoned after the harbor silted up.Excavations (1869-74) of the ruins of the temple brought to light many artifacts.Later excavations uncovered important Roman and Byzantine remains. Quoted from The Columbia Encyclopedia,Sixth Edition.2001. In a Christian version of a widespread story,martyrs immured in a cave near Ephesus during the persecutions by Decius (c.250).Long afterward,in the 5th cent,they awoke (as from sleep) and were taken before Theodosius II,Roman emperor of the east.Their story reassured the emperor,who had been wavering in his faith.The youths returned to their cave,to sleep again until Judgment.The story, thought to be of Syrian origin,was popularized by Gregory of Tours. Feast:July 27.